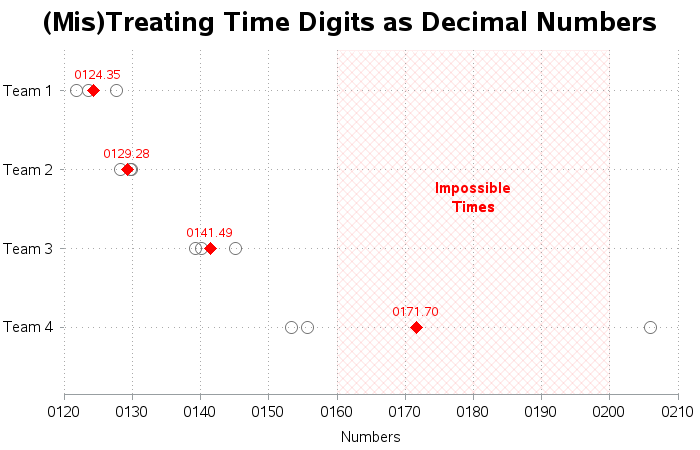 I thought this an interesting enough problem that I should create an example, to hopefully steer data analysts in the right direction when working with time data ... and avoid the data-integrity problems that result in (mis)handling time digits as decimal numbers. And if I plot these decimal values, and their average (in red), I get the following graph. It looks pretty nice, and the averages seem reasonable ... at first glance. But upon closer examination, it seems odd that one of Team 4's races is so much slower than their other two races. And if you look at Team 4's average - what is 1:71.70 (how can you have a '71' in the minutes place?!?) And if you look at the horizontal/time axis, you'll notice that it shows a range for '1:60' to '2:00' ... which are impossible times. And now the table of data looks like this (notice the average time for Team 4 is 1:58.37, rather than 1:71:70). Here is a link to the full SAS code, if you'd like to download it and experiment with it. Yes, SAS date value: is a value that represents the number of days between January 1, 1960, and a specified date. 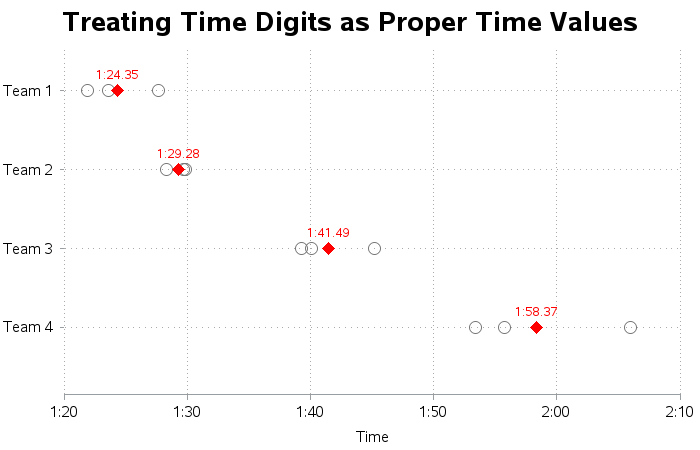 Anytime I bring an Oracle date into SAS I always have to divide it by the number of seconds in a day (86,400) for SAS to treat it like any other SAS date value. Hmm ... I guess that indicates you're converting a time value (number of seconds) to a date value (number of days)? I like this documentation of the time format better than the page you linked to in the post. 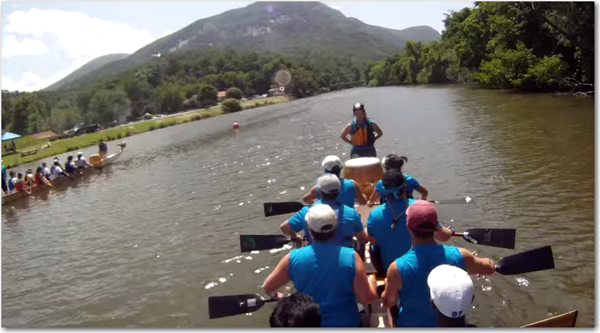 I can't believe there is a DragonBoat match in U.S. . That should belong to China. Surprise! In SAS , there is a special informat for such scenario -- stimer11. And more important thing is you don't need to pad 0 in front of it to make hours. Thanks for the tip, Ksharp!